You may have heard of Sephi and Maya on our other blog, Pet Auto Safety Blog.com. Sephi And Maya are more than just my dogs, they are a part of the family. Sephi is a 9 year old Lab/Shepherd/Chow mix. She has many nicknames including Boo Boo, Brat, and recently, Old Lady. Maya is almost 3 years old and she is a yellow Lab. Maya’s nicknames are Maya Papaya, Poopers, Nosy, and Trouble. Some of the nicknames may sound mean, but I say it out of love. Check them out in this cute video. Sephi is talking in her best doggy way and Maya is wondering what all the excitement is about. Sephi talks when she is excited and especially when it comes to feeding time. Maya always likes to investigate what is going on – hense the nickname Nosy. Do you have a cute video of your dog? Share it with us. Email us at naturebydawn@aol.com and ask us to post it on our blog. Dog Training – What Motivates Your Dog to Learn? Having trouble teaching your dog basic commands or tricks? Every dog is different so there is no one simple answer on how to motivate him to learn. However, we can give you details on three simple motivational methods – food drive, prey drive, and sociability drive. But first, the most important thing you can do to help any dog learn is to always make learning fun. Try to avoid using negative punishment. Your only method of punishment will be to withhold the dog’s reward if they don’t comply with the command. Keep in mind that a part of making learning fun is to start with simple steps which earns your dog a reward. 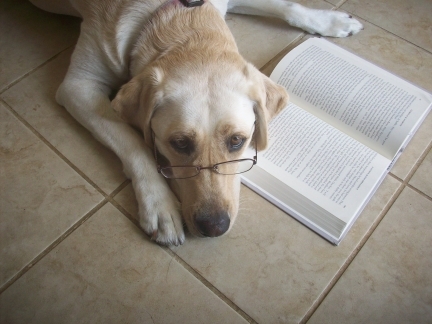 A dog who is rewarded is motivated to learn more. A dog who continuously doesn’t earn a reward is less likely to be enthusiastic about training. Food drive is probably the most common and simplest method for motivating a dog to learn. Many dogs love food and are eager to do whatever it takes to earn that food. But not all dogs are enthusiastic about every kind of food and some dogs aren’t motivated by food at all. If you find that your dog is not motivated by food, try different kinds of food before trying the other motivational methods. Sometimes a dog will not be motivated by a dry biscuit, but he may do doggy flips for a cheesy treat. Practice with different kinds of treats and observe your dog’s reaction to each. You should be able to tell which one (or ones) he is most eager for. Also keep the healthiness of the treats in mind. Try not to use fatty things like actual cheese. Try a cheesy dog treat instead. There are hundreds of different kinds of dog treats on the market and some are specifically made for motivational training. My dogs like Charlee Bear dog treats. Prey drive is where your dog goes crazy over a certain toy (or toys). If food didn’t work, try toys. Show your dog a toy and play with him for a bit. Then put it away. Repeat several times through the day and week. Does your dog get excited when you get the toy back out? If not, try a new toy. If so, your dog may be motivated to learn with a prey drive. Most police dogs and other working dogs are motivated with prey drive. My dad had a police dog used to sniff out drugs. When he found an illegal narcotic, he was rewarded with a ball. He really loved that ball. Some dogs are just eager to learn because they are eager to please. No treats or toys are required, just your love and affection. My dog, Cassie, was like that. She loved to please me and I gave her lots of love in return. Her praises weren’t simple pats on the head. They were exciting events where I talked in an excited voice and scratched her in the places that she loved to be scratched the most (behind the ears, on the back just above the tail, on her belly). When you find which reward motivates your dog the most, do not allow your dog to have that reward at any other time except training time. For example, if your dog loves bits of liver treats, only give him liver treats when he earns it by obeying your command. Likewise, if your dog loves his Kong toy, only let him play with it if he has done what you told him to do. But if your dog loves praise, don’t necessarily withhold petting. Save the super excited praise for training. The regular pats and casual ear scratches can continue as usual. I recently read, “Mine! 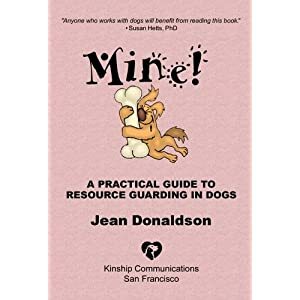 A Practical Guide to Resource Guarding in Dogs” by Jean Donaldson. I purchased this book at the recommendation of the dog trainer who mentored me while I was working on getting my dog trainers certificate from the Animal Behavior College. I was having problems with Sephi behaving aggressively towards smaller dogs and my mentor advised me that this book would be a great help. Sephi’s aggression issues with smaller dogs usually comes about when food is involved. Food is considered a valuable resource to many dogs and may trigger excessive guarding and/or aggression issues when it comes to protecting that resource. Other things a dog might consider a valuable resource worth guarding are toys, beds, sleeping spaces, their owners, or even parts of themselves (like some dogs hate to have their feet touched). Indications that your dog may have a resource guarding issue includes growling, showing their teeth, snapping, or biting. This book is geared more towards dog trainers, but it can be followed by pet owners who are fairly savvy when it comes to dog training. The book goes into great detail when explaining what resource guarding is and the various reactions of the dog which is guarding. The book also gives step by step instructions on how to deal with each type of resource guarding. These instructions are very extensive. Each step can take weeks or more to complete. But if you have a dog who snaps at your children when they get too close to him while he is eating, or a dog who growls when you try to move him off your bed, it will be worth your while to read this book and follow the steps. While I found this book very informative and helpful, you should know that a lot of the terminology in the book is terminology used by dog trainers. If you are not familiar with the vocabulary of a dog trainer, you may find that you have to consult a dictionary every other page or so. As a result, you may not completely understand some of the steps and may be less likely to implement them properly. If you are unsure of what terms like desensitization, counterconditioning, classical conditioning, or operant conditioning are, you should either a) hire a professional dog trainer instead of reading this book, or b) read a book on basic dog training before reading this book. The Pomeranian is a toy dog breed whose head looks like that of a little fox. Not at all related to the fox, however, the Pomeranian is a German spitz breed. Other spitz breeds include the Samoyed, Keeshond, Norwegian Elkhound, and others, and the Pomeranian is the smallest of them all. Ancestors of the Spitz breeds were sledding dogs but the Pomeranian was bred as a companion dog. Hundreds of years ago, the Pomeranian was a larger dog and predominantly white. But by the time his popularity spread he was a small 3-7 pound dog standing 8 to 11 inches tall. And he came in a variety of colors. The black Pomeranian and the red Pomeranian seem to be the most common but the American Kennel Club accepts any color and pattern of Pomeranian. The coat of the Pomeranian is double-layered. He has a soft undercoat and a long harsh outer-coat. This type of coat needs regular brushing – at least twice weekly, more during shedding season. The head of the Pomeranian is very distinct. His muzzle is rather small in proportion to his head. The fluff of hair around his head makes his muzzle look even smaller. This proportion along with his almond-shaped eyes and small perky ears is what makes him look fox-like. The rest of his body, however, doesn’t look anything like a fox. The Pomeranian has a short neck and compact body build with small compact feet. His tail is as fluffy as that of a fox but it is carried over his back rather than flowing behind. In general, the Pomeranian is not as affectionate as other small dog breeds. But he is a curious little guy who loves to play. The Pomeranian can be a busy little dog with a lot of energy. But even though he has a lot of energy, the Pomeranian doesn’t need to go on long exerting walks. Just one short walk or several outdoor visits is all the Pomeranian needs. And probably some indoor games like fetch to keep him from using his energy to get into mischief. Like many other small dog breeds, the Pomeranian is feisty and tends to bark a lot. And he tends to have that “big dog” mentality. He can be aggressive towards other dogs but ordinarily gets along well with other pets. The Pomeranian can be good with older children but may not be good with younger children. If not properly socialized when he is young, a Pomeranian may not be good with strangers either. Training the Pomeranian can be challenging. His playfulness probably keeps him from focusing and his aloofness may not give him that drive to please his human. Using positive reinforcement methods and rewarding him with a special toy or treat is a good way to motivate a Pomeranian to learn. Potty training can be difficult in many small dog breeds, including the Pomeranian. Constant attention is needed when potty training a Pomeranian. And crate training is recommended for those times when no one is home. The Pomeranian dog breed is prone to a few hereditary and breed-specific health issues. If careful breeding is not done, the chance of a Pomeranian developing patellar luxation or progressive retinal atrophy increases. Patellar luxation is an abnormal skeletal issue where the knee cap slips in and out of position. This can cause painful walking or possibly even lameness. Progressive retinal atrophy is where the retina of the eye gradually deteriorates, eventually leading to blindness. An ill-bred Pomeranian can also end up with severe temperament issues such as aggression. Carefully researching breeders before buying a Pomeranian is highly recommended. All-in-all, the Pomeranian is a fun little dog. And he is extremely cute. Like any dog, he needs a good home with a family that is going to care for him as well as take him for walks and play with him. If you are considering buying a Pomeranian, remember to research the breeders thoroughly. Having papers with the American Kennel Club is not enough to get a good quality breed since the AKC does not regulate the quality of breeders. A good breeder will be willing to provide detailed information about the genealogy of their dogs and will most likely be a member of a Pomeranian dog club. Be sure to socialize your Pomeranian puppy as soon as possible to help alleviate any issues such as dog aggression or unfriendliness towards strangers. Also, consider getting an adult Pomeranian from a Pomeranian rescue group. Dog rescue groups are all over the country and often have great dogs in need of a good and permanent home. The most adorable dog and cat figurines are available at Animal Figurine Store.com. Dog figurines come in almost every AKC breed. There are dog figurines in the Sporting Dog, Hound Dog, Terrier, and other AKC groups. The dog figurines also come in different styles. There are the standard dog figurines of just the dogs, dog figurines dressed as little devil dogs, and My Dog Figurines where the dog is in a unique pose or setting. Cat Figurines come in a variety of cat breeds including the standard domestic short hair brown tabby, red or orange tabby, silver tabby, black, black and white, and calico. Other cat figurines include the Persian, Rag Doll, Siamese, and others. If you are interested in dog and cat figurines for yourself and/or as a gift, please feel free to use the discount code naturefriend (all lower-case and all one word) when you place your order. This discount code will give you 10% off. And you can use it again if you ever place another order. And you can share the discount with a friend. 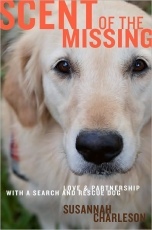 Scent of the Missing is a true story written by a search and rescue (SAR) dog owner. Based in Texas, Susannah Charleson first runs alongside other search and rescue dog owners in order to learn what it takes to also be a SAR volunteer. The book , which is more like a journal, is about her journey, the struggles, and the intense dedication it takes to be a part of the SAR volunteer team. We learn that Susannah trains with the team many months before she purchases her own dog for SAR training. After many months of finding a qualified breeder, Susannah finally gets a Golden Retriever who she names Puzzle. Puzzle is a puppy, of course, and both dog and owner still have many more months before they can become a certified SAR team. The book continues on with the difficulties and successes that she and Puzzle go through. And finishes with Puzzle getting her certification and going on her first search. Overall, I think the book is very well written. Some of the chapters are about her personal life struggles and only marginally related to Puzzle and the search and rescue. But Susannah keeps the overall story relatable and interesting. I often find myself unable to put the book down and look forward to the next night when I can read more chapters. As Susannah tells the true story of her experience, she doesn’t sugar-coat it or embellish the facts. As much as I’d love to hear a miraculous story where Puzzle or some other search and rescue dog is directly involved with saving a life, I love how Susannah doesn’t glorify the truth. Most of the time, the SAR dog doesn’t find the missing person themselves so much as they direct the proper authorities on where the missing person might be. Nevertheless, the SAR dog provides a great contribution in helping authorities to narrow down what might otherwise be an endless futile search. I am intrigued with all that one has to go through in order to train for and own a SAR dog. And I find myself being proud of Puzzle when she succeeds. I learn that not all dogs are cut out for this job, even with all the training, and that some dogs lose heart in the search and rescue and end up retiring early. Susannah and Puzzle’s success is an effort to be greatly admired and I thank her for sharing her journey. This book can be purchased at your local book store or online at Amazon.com affiliate page titled Dog Lover’s Book Store. Maya & Sephi Found Me Hiding! Have you ever played hide-and-seek with your dog? I have and it is the best fun ever. Playing hide-and-seek with your dog does not mean your dog hides and you find him. (Don’t you hate it when you look all over the house for your dog and call his name only to find that he is sleeping soundly under the bed?) Playing hide-and-seek with your dog is where you hide and your dog finds you. When your dog is not paying attention, go into another room and hide behind the door. Then call your dog’s name in a happy voice. Keep quiet and still as your dog looks around and if it seems he is way off base, call his name again. When he eventually finds you, praise him as lavishly as possible. You can reward with treats if you want or just tell him what a good dog he is over and over again as you give him lots of belly rubs or other generous petting. If your dog is not interested in coming to find you, try bribing him with treats or a special toy. Have him sit and stay in a place where he can see you get his treats or toy. Then go hide. When your are hidden, give his release command for coming out of stay and call his name. This game is not only fun for both you and your dog, but it may also help with training and bonding. By praising and rewarding your dog when they find you during a hide-and-seek game, they learn that coming when they are called is a really fun thing. And they are more likely to come when called more often. Playing any game with your dog is a good way to build a bonding relationship. Hide-and-seek helps your dog learn that being around you and paying attention to you is fun. If you want that dog who is excited to see you when you get home from work, try playing the hide-and-seek game. I was surprised to learn that playing hide-and-seek with my long since gone dog, Smokey, had helped to teach him to stick by my side when we were out hiking. I never had to worry about him running off after other animals when we went on our hiking trip. The hide-and-seek games we played when he was young definitely helped with both his training and our bonding. Despite the name, the Great Dane dog breed is not a Danish dog. He is a very old German dog breed. In ancient times, the Great Dane was used as a wardog and as well as for hunting boar. In fact, the Great Dane has been called a German Boarhound. The Germans, however, call him Deutsche Dogge. The Great Dane is a big dog yet proportionately very graceful and elegant in appearance. Standing 28” to 35” tall and weighing 110-180 pounds, the Great Dane is truly a large dog breed but mostly very gentle. While the Great Dane dog breed was bred for courage on the hunt, he is only a good guard dog in the intimidation of his size. Otherwise, he is generally friendly to strangers. The Great Dane can be very affectionate and easygoing with people but may not get along well with other pets. Although the Great Dane is not as eager to please as a Labrador Retriever, he is moderately easy to train. He can be a bit sensitive in training so use mostly positive reinforcement methods for maximum response. You would think that such a large gallant dog would require a lot of exercise. But the Great Dane dog breed only needs moderate daily exercise. He is not overly energetic or playful. His easy nature makes him a great house dog but he needs a big bed and enough room to stretch out his long legs. Grooming for a Great Dane is even easier. Occasional brushing during shedding season or after baths may be all that is required. The only major upkeep concern for the Great Dane is his tendency to drool. Health concerns for the Great Dane dog breed are relatively few, but require serious consideration if you want to buy one. As with most large breed dogs, the Great Dane has the risk of developing hip dysplasia. Elbow dysplasia is also a concern. Both of these can be tested and a good dog breeder will be willing to provide proof of such testing. Since a dog doesn’t develop hip or elbow dysplasia until after a year or more, do not accept any 1 year guarantees that an unscrupulous breeder may offer. Other health concerns common with the Great Dane dog breed include gastric torsion, cardiomyopathy, and bone cancer. Gastric torsion is where the stomach twists and traps contents – a very dangerous situation which can cause death. Gastric torsion is not necessarily genetically inherited health risk like hip dysplasia. It is a health risk associated with large dogs in general. Cardiomyopathy is where the chambers of the heart enlarge and cause congestive heart failure. This health issue can also be inherited. Besides his great size, features of the Great Dane dog breed are quite recognizable. If you have ever heard of the comic character (now movie character) Marmaduke, then you are already familiar with how the Great Dane looks. He has a long rectangular head, square jaw, and a thick heavy muzzle. Overall, his body is equally proportioned – his chest is neither too deep nor too narrow, his legs are long but not so long as in comparison to his body. The ears of a Great Dane are medium sized and droop. However, when his ears are cropped they stand erect. The Great Dane dog breed comes in a variety of interesting and unique colors. 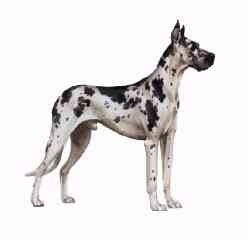 The Great Dane which is white with irregular patches of black is called a Harlequin Dane. The term ‘harlequin’ for a black and white dog is unique to the Great Dane. The Great Dane dog breed can also be brindle in color. Brindle is a light color with black cross stripes, like a tiger but the stripes are much smaller. A fawn colored Dane is a Great Dane which is golden-yellow or tan color and has a black mask on his face. A blue colored Dane is a Great Dane which is a solid gray-blue. And finally, the Great Dane dog breed can also be a solid black in color. The Great Dane is a great dog. Except for the dog food bill, his easygoing nature makes him generally easy to care for. He is perfectly content being an indoor dog and does not require a big yard – or any yard as long as he gets regular walks. If you want to purchase a Great Dane, be sure to research breeders thoroughly in order to avoid any unscrupulous dog breeders who don’t breed quality dogs and don’t check for inherited health issues like hip dysplasia, cardiomyopathy, and bone cancer. You can also check online or at your local animal shelter for Great Dane rescue groups. A Great Dane rescue group rescues and adopts out Great Dane dog breeds who might have been displaced, neglected, or given up by their owners for various reasons. For a great Great Dane dog figurine, visit AnimalFigurineStore.com.